What in the World Is Metallic Hydrogen? 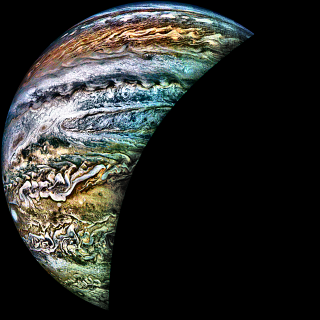 Below Jupiter's swirling cloud tops, the common element hydrogen exists in a very strange state. Solid. Liquid. Gas. The materials that surround us in our normal, everyday world are divided into three neat camps. Heat up a solid cube of water (aka ice), and when it reaches a certain temperature, it changes phases into a liquid. Keep cranking the heat, and eventually, you'll have a gas: water vapor. When it comes to hydrogen, we usually don't encounter it at all, except when it's buddied up with oxygen to make the more familiar water. Even when we do get it by lonesome, its shyness prevents it from interacting with us alone — it pairs up as a diatomic molecule, almost always as a gas. If you trap some in a bottle and pull the temp down to 33 kelvins (minus 400 degrees Fahrenheit, or minus 240 degrees Celsius), hydrogen becomes a liquid, and at 14 K (minus 434 degrees F or minus 259 degrees C), it becomes a solid. You would think that on the opposite end of the temperature scale, a hot gas of hydrogen would stay … a hot gas. And that's true, as long as the pressure is kept low. But the combination of high temperature and high pressure leads to some interesting behaviors. On Earth, as we've seen, hydrogen's behavior is straightforward. But Jupiter isn’'t Earth, and the hydrogen found in abundance within and beneath the great bands and swirling storms of its atmosphere can be pushed beyond its normal limits. Buried deep below the planet's visible surface, the pressures and temperature rise dramatically, and the gaseous hydrogen slowly gives way to a layer of supercritical gas-liquid hybrid. Due to these extreme conditions, the hydrogen can't settle into a recognizable state. It is too hot to stay a liquid but under too much pressure to float freely as a gas — it's a new state of matter. Descend deeper, and it gets even stranger. Even in its hybrid state in a thin layer just beneath the cloud tops, hydrogen is still bouncing around as a two-for-one diatomic molecule. But at sufficient pressures (say, a million times more intense than the Earth's air pressure at sea level), even those fraternal bonds aren't strong enough to resist the overwhelming compressions, and they snap. The result, below roughly 8,000 miles (13,000 km) under the cloud tops, is a chaotic mix of free hydrogen nuclei — which are just single protons — intermingled with liberated electrons. The substance reverts to a liquid phase, but what makes hydrogen hydrogen is now completely disassociated into its component parts. When this happens at very high temperatures and low pressures, we call this a plasma — the same stuff as the bulk of the sun or a lightning bolt. But in the depths of Jupiter, the pressures force the hydrogen to behave much differently than a plasma. Instead, it takes on properties more akin to those of a metal. Hence: liquid metallic hydrogen. Most of the elements on the periodic table are metals: They're hard and shiny, and make for good electrical conductors. The elements get those properties from the arrangement they make with themselves at normal temperatures and pressures: They link up to form a lattice, and each donates one or more electrons to the community pot. These dissociated electrons roam freely, hopping from atom to atom as they please. If you take a bar of gold and melt it down, you still have all the electron-sharing benefits of a metal (except the hardness), so "liquid metal" isn't all that foreign a concept. And some elements that aren't normally metallic, like carbon, can take on those properties under certain arrangements or conditions. The big fuss is that metallic hydrogen is not a typical metal. Garden variety metals have that special lattice of ions embedded in a sea of free-floating electrons. But a stripped-down hydrogen atom is just a single proton, and there's nothing a proton can do to build a lattice. When you squeeze on a bar of metal, you're trying to force the interlocking ions closer together, which they absolutely hate. Electrostatic repulsion provides all the support a metal needs to be strong. But protons suspended in a fluid? That ought to be much easier to squish. How can the liquid metallic hydrogen inside Jupiter support the crushing weight of the atmosphere above it? The answer is degeneracy pressure, a quantum mechanical quirk of matter under extreme conditions. Researchers thought conditions that extreme might be found only in exotic, ultradense environments like white dwarfs and neutron stars, but it turns out that we have an example right in our solar backyard. Even when electromagnetic forces are overwhelmed, identical particles like electrons can only be squeezed so tightly together — they refuse to share the same quantum mechanical state. In other words, electrons will never share the same energy level, which means they will keep piling on top of each other, never getting closer, even if you squeeze really, really hard. Another way to look at the situation is via the so-called Heisenberg uncertainty principle: If you try to pin down the position of an electron by pushing on it, its velocity can become very large, resulting in a pressure force that resists further squeezing. So the interior of Jupiter is strange indeed — a soup of protons and electrons, heated to temperatures higher than that of the sun's surface, suffering pressures a million times stronger than those on Earth, and forced to reveal their true quantum natures. Learn more by listening to the episode "What in the world is metallic hydrogen?" on the Ask A Spaceman podcast, available on iTunes and on the web at askaspaceman.com. Thanks to Tom S., @Upguntha, Andres C., and Colin E. for the questions that led to this piece! Ask your own question on Twitter using #AskASpaceman or by following Paul@PaulMattSutterfacebook.com/PaulMattSutter.